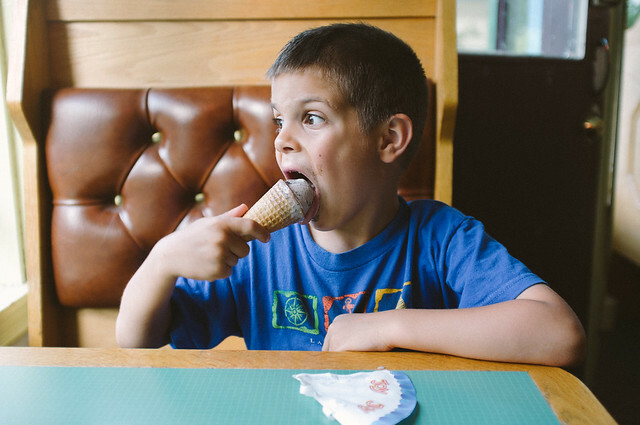 Looking through the archives recently I found a shot from last summer that had slipped through the cracks, my son enjoying an ice cream cone. Boy, do they grow up fast. I need to remember to shoot the important things more. Aww, how cute! Agreed; during Thanksgiving dinner I was shocked by how big my nieces have gotten – my younger niece was 3 what seemed a year ago and now she’s in kindergarten..
One of the things I do on his birthday is to give him a photo book with prints of the pictures I toke him that year.